I suspect some potential audience members are reacting to the trailers for Monsters University with a bit of a sigh or a bit of a groan. Pixar is a company known for overwhelming critical and box office successes, but lately their output has been slightly mixed. Cars 2 was colorful but empty, and Brave was thoughtful but sloppy. They are not so much the “sure thing” company we came to believe they were, having dipped into the occasional mediocrity, so a sequel to one of their less talked-about movies, Monsters Inc., that appropriates the college comedy clichés codified by such lowbrow classics as Animal House and Revenge of the Nerds probably doesn’t seem likely to belong in their upper echelons either. Fortunately, Monsters University is Pixar’s best movie in years, finding the now-iconic (although still typically lowbrow) frat house canon a poignant delivery system for young idealism clashing with desperate reality. And if that sounds too fancy for you, get this: it’s really, really funny. The world Pixar has crafted for these characters is just strange enough that the environment can be mined for unexpected throwaway jokes that keep half the movie feeling fresh even when the plot depends entirely on familiar college movie conceits. 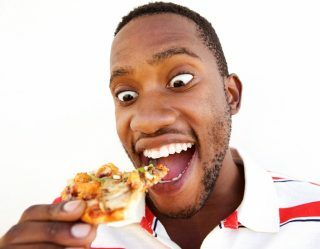 The characters are developed enough to have distinct points of view that make their interactions with each other believable, but also bizarre enough that sometimes their whole conception is funny. Sean Hayes and Dave Foley voice Terri and Terry, two heads on the same monster. One of those heads is a dance major. The other one is not, and refuses to dance with his half of the body. 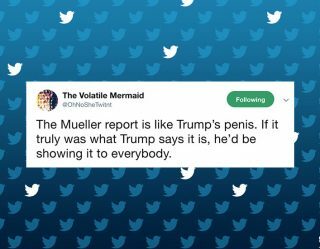 That’s funny, damn it. Monsters University is packed with high-concept, conversational, situational and character-driven humor from beginning to end. The plot finds Mike Wazowski (voice by Billy Crystal) from Monsters Inc. fresh out of high school and attending the illustrious Monsters University to become a “scarer.” For those who don’t remember, the world of Monstropolis is powered by the screams of young children, and so many monsters aspire to be those demons who come out of kids’ closets and frighten them in the middle of the night, thus saving the monster world. Mike has the knowhow and the book smarts to be a top-tier scarer, but he’s also adorable. He’s a green orb with one eye, a charming smile and a neurotic sense of humor. Pinhead he is not. Also attending Monsters University is James “Sulley” Sullivan (voice by John Goodman), a natural scarer who doesn’t see the value of studying when all he has to do is roar like a maniac grizzly bear. A rivalry develops between Mike and Sully, but when they accidentally vandalize a memorial to Dean Hardscrabble (voice by Helen Mirren), she expels them from the scaring program, dooming their respective futures. As with many college comedies, the fate of our heroes now depends on a deeply contrived fraternity competition: if Mike and Sulley win, they will be proven the best scarers in school, and earn a place back in the program. If they lose they’ll leave school forever, because that’s how college movies work. 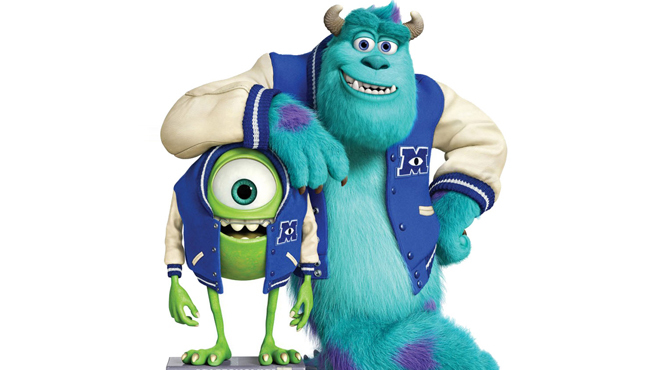 But since both Mike and Sulley are outcasts, the only frat that will have them is nerdy ol’ Oozma Kappa (“O.K.”), which is full of art majors and forty-year-old former door-to-door salesmen. What follows is a series of fascinatingly conceptualized combinations of monster mythology and frat house humor, and of course valuable lessons, like when Sulley learns the importance of studying. 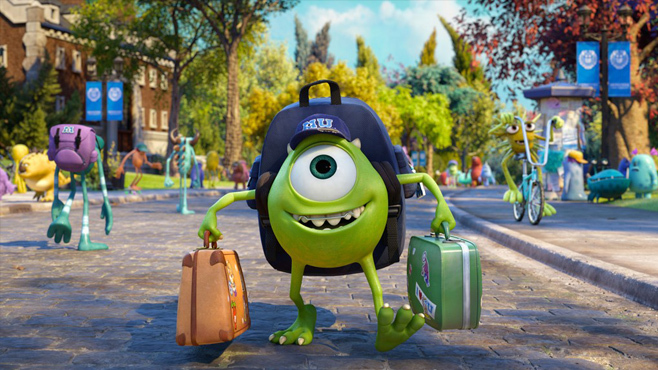 But what elevates Monsters University from a funny albeit clichéd comedy to a genuinely great motion picture is the path poor Mike makes, because no matter how smart he is, and no matter how well he knows the material, he’s just not scary. Unlike the myriad family films that assure children that if you dream hard enough you can accomplish anything, Monsters University dares to inform children that if you dream hard enough, sometimes you can only come close. That may seem like a dark moral for a kids movie, but Monsters University is playing off the success of Monsters Inc., so it’s important to remember that the kids who grew up with that 12-year-old movie are probably thinking about college themselves right about now. 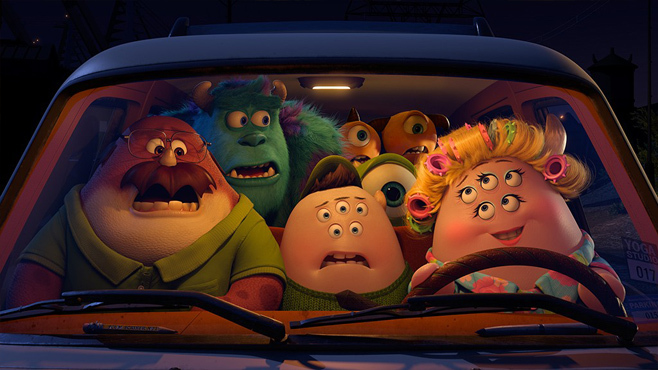 Like Toy Story 3, which used the depressing theme of growing out of your toys (depressing, at least, for the toys) to illustrate a greater theme of mortality, Monsters University has grown up with the original film’s audience. 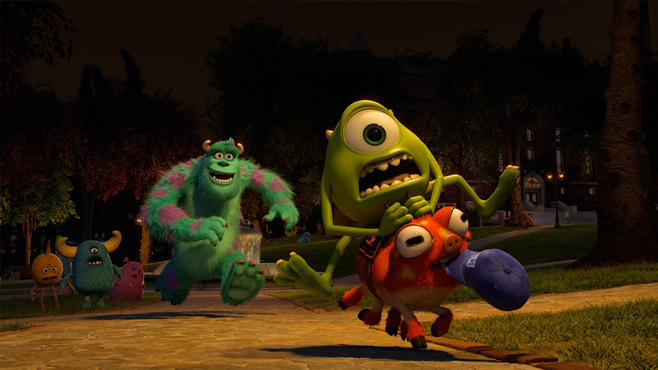 Best of all, with this as a storytelling model, there is no need for a Monsters 3, since by the time the core audience is old enough to encounter the next major life hurdle – starting a family – they will be able to watch Monsters Inc. again and relate to Mike and Sulley for a change. The cycle will complete itself, at least until those kids reach their Up years. This respect for the children who grew up with Pixar, and who probably still watch their movies (because practically everyone does), prevents Monsters University from feeling like a tired cash-in. 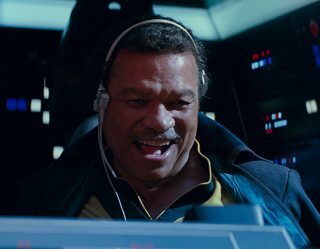 It’s a thoughtful, funny, smart and creatively conceived comedy that dares to present a message that every young person needs to learn, but that most family movies are terrified to tell them. 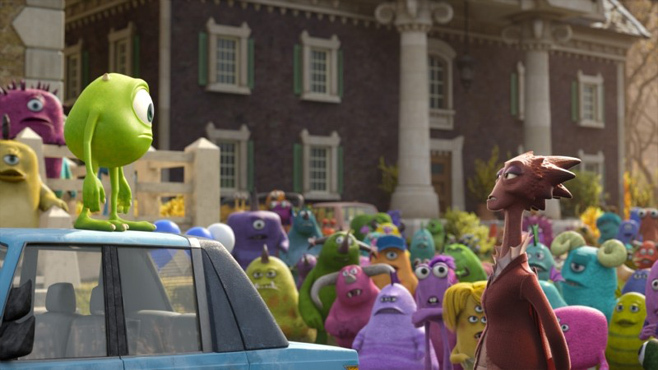 Unlike most prequels, Monsters University makes the original film look better not by contrast, but in context. I can’t wait to watch them both again.